I didn't work there, but I remember the mill being a big part of Bellingham. 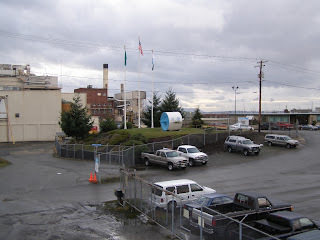 Just logged onto December 16 Bellingham Herald and saw that the last part of GP's Bellingham mill closes December 21. Closing of the paper mill. The pulp section closed in 2001. Rising cost of electric power is one factor leading to it's closure. Population in the Pacific Northwest has outgrown the inexpensive hydroelectric resource. I read that wood chips, used in the pulp making process are more expensive as well, in this area at least. It used to be that GP was a big "reason for being" in Bellingham. An economic reason for being at least. Kind of like "reason for being" is the work you do or the cog you fit in the giant system we call an economy. When I came to college, I wondered what percent of the economic pie for Bellingham was GP, what percent was the University and so forth. 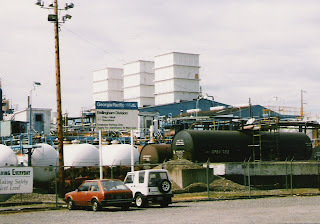 When GP closed it's pulp mill in 2001, I wondered if Bellingham's retail balloon would deflate. There seems to be a lot of stores in this area that sell to the local market. A lot compared to the number of businesses that bring money in from outside the local market. Can all these stores survive selling to one another's employees? Can all these stores survive with little "fresh money" coming into the region from outside? Little money to offset all that money going out buying the products we consume. Products from outside the region at least. I hope I haven't lost you yet. It's talk of "basic sector versus secondary sector." Most retailing would be considered secondary sector. The stuff I learned in my economic geography classes. Surprise! The loss of GP payroll didn't "seem," at least, to deflate local retailing. New restaurants and shops keep coming. Some struggle and close, but others do a bang up business. A growing market of retired folks have been moving to the area bringing money with them. To some extent, the local economy can coast on home equity money; a phenomenon made possible by unprecedented growth in real estate prices over the past 20 years. Many home buying consumers, in Bellingham, don't have to work. They often don't even have to pay a mortgage. Selling some previous home for a fortune means just being able to "write a check" for the new one with money left over. I have friends who have done this. I'm sure there is more details on how the guts of a local economy works, beyond what I can fathom. New consulting firms coming to town, expansion at local oil refineries, the Internet. On one hand, it's how people eat, but on the other hand, it's "just money." Often it's mind boggling, but somehow the economy keeps going. I remember 4 tours of GP that I have taken over the years. They used to offer tours during summer months at regular times. I showed up for one in the late 1970s and got a souvenir box of tissue products. In the 1980s, there was a computer club called "Bellingham User's Group." BUG for short. We toured GP and looked at the computers. That club had a lot of GP employees as members. It met in a drab old classroom at one of GP's administrative buildings. Later in the 1980s a friend of mine worked as a tour guide. I took his tour. Eventually tours were not offered anymore, except under special circumstances. 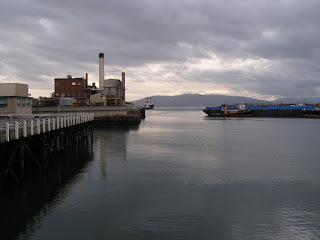 The last tour I took was sometime after pulp mill's closing. Local citizens went on a tour organized by Waterfront Futures Group. In 1987, GP had a chlorine leak the same day as the big 1987 Wall Street plunge. Wall Street plunge was early afternoon. GP leak was early evening. I'm sure I remember, it was the same day. The music stopped in an aerobics class that I was in. Someone made an announcement kind of like, "don't panic, but we are evacuating due to a chlorine leak." First I thought it was a leak at the Y swimming pool, downstairs, but soon realized it was GP. Downtown Bellingham was being partially evacuated. The crowd of people returning their key cards for the locker room was quite impressive. Milling around the service desk all at once. Now they don't even use those type of key cards at that gym anymore. I took the short walk to my place and got a portable radio. Then headed up hill to Western Washington University thinking, "chlorine is a heavy gas that sinks." Figured the University would be like a "safe haven." "An ivory tower." I didn't smell very much chlorine and soon after I got to campus, the radio issued an "all clear." It was OK to come back downtown. Chlorine plant from years back. 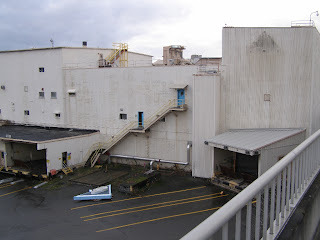 1987 leak was not from chlorine plant itself, it was (if I remember correctly) loading bleaching formula from a rail car into the paper bleaching section of the mill. People grumbled about GP using chlorine to bleach paper. In the last years of the pulp mill operation, I think I remember they switched to a new kind of "non chlorine" bleaching process. When there's finger pointing, I often blame the consumer. Part of that pure white paper, they produced, was used for photography. Remember, pure white photo paper for snapshots? Most of the rest was used in toilet paper of various colors. It used white as a foundation. I remember writing a letter to the editor, sometime in the mid 1990s suggesting that folks who don't like chlorine ought to start using digital cameras. Bypass the need for photographic paper and so many chemicals used in film developing. Back then digital cameras were new and still fairly rare. Now, it seems like old fashioned "paper" photography is also becoming a relic of history. More of my memories about Bellingham with Georgia Pacific.